If you follow me on Twitter (you DID know that I’m on Twitter, right? It’s just a hop, skip, and a jump from where your eyes are right now. Look at the left-hand column of this page. NO: Your other left! Ah, there it is. ), you had an inkling yesterday that I was in the city. I have so much to share that I’m going to have to split it up into 3 posts! And by the way, I really want to put mass quantities of hyperlinks into these posts so you can do some more reading, but I’m not going to because it takes lots of time to type in the extra code for the links to open in new windows (I don’t want you little darlings leaving me!). Naturally, all of the things I will describe can be easily Googled if you want more information. There are one or two links that I will NEED to put in though; humor me and click those. 1. I went BY MYSELF. Can I get a Woot Woot? (Not because I was able to “handle it” alone, like a Big Girl or something, but because I was ALONE. Okay, now you can Woot again. 2. I had a plan, some goals if you will. I wanted to do a couple of the things that my kids never want to do. 3. I LOVE this city. But if you’re a reader of mine, you already know that. I took Roxie to Day Camp as soon as they were open (7 a.m.! ), drove my car back home, walked to the train station (about a mile or so) and jumped on the express train to the city. The express train is great because it only takes about 35 minutes to get there. If you get on a train that makes all the stops, it is about an hour and ten minutes! That’s why I avoid those. I ate my yogurt while I was waiting for the train: wouldn’t want that to get warm! It was already quite sticky outside; the forecast was for scattered thunderstorms (hence the umbrella in my purse) and it was humid as all get-out, first thing in the morning. On the train, I listened to my iPod and wrote up an outline for a magazine article in my little notebook. Upon arriving at Union Station, I chuckled to myself as I made my way off the train platform among the other hundreds of people. Why did I chuckle? Because, even alone, I said the same thing I say everytime I’m getting off the train platform among the other hundreds of people: “Moooooo….Moooooooo! Moooooo!” (Get it? It feels like a herd of cattle? Get it?) Of course, I didn’t say it too loud because I wasn’t actually saying it TO anyone except for myself. I didn’t want to be labeled as a Crazy before setting foot outside the train station. I headed down Washington to Wacker, where I walked along the river to get to the correct dock. On the way, I discovered the recently-installed Chicago Vietnam Veteran’s Memorial, so I checked it out. It’s quite beautiful and a great tribute. …and I sat next to a lovely woman, an interior designer from Oregon who was in town to tour all of Frank Lloyd Wright’s buildings. I loved being the Local Yokel; it was fun to give them little travel hints about the city. I am trying not to go into too much detail because I’ll be here for weeks, but this cruise is something I should have done years ago. I did the one that is put on by the Chicago Architecture Foundation (it has the reputation of being the best river tour), and I learned so much about my hometown that I didn’t know, it’s sort of embarrassing. I highly recommend the CAF river cruise to anyone who comes to town, but ESPECIALLY locals. …can’t remember what these are called but the one on the left echoes the bridge houses with a bridge in between (at the top of the building) and the one on the right curves with the river. Pretty cool. By the way, the cruise was 90 minutes long. 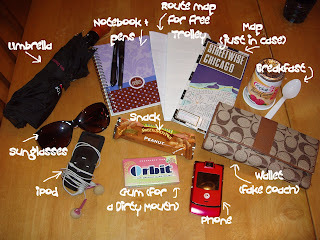 And, oh yeah, did you notice that something was missing from my purse? By the way, at the end of Part 3, I’m havin’ a contest! Woo Hoo! But before you get there, you have to read Part 2, HERE. 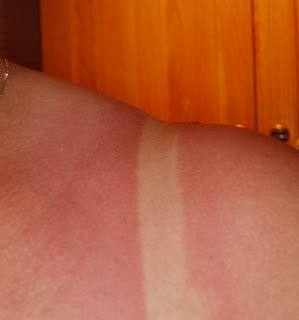 Um, ouch on the sunburn! I can’t believe that the Trump building is still under construction! I saw a special on the building of that like a year ago! Good for you to head off alone! I can’t wait to see the next 2 installments! I am anxiously awaiting parts 2 and 3. Bring it on, Melisa! Ouch! Your slightly well done, there! I think you just inspired me to take the hubby and the child down for a boat ride!! Sue: Um, ouch is right! I just lubed up with some heavy-duty moisturizing lotion. I’m actually surprised I slept last night; but that’s what 12 hours of mostly walking will do, I guess! Maybe you should load the sunscreen now for your next adventure? I LOVE the archtectural cruise. It totally rocks! And the buildings you don’t know. I actually used to work in the one on the left, back when I was a management consultant. It doesn’t have a name — it’s just 225 W Wacker 🙂 The Mart on the opposite side of the river though is a cool one (and so totally redone since I worked in the loop!). Did you get any pictures of that one? Army brats: Absolutely. I don’t think I’ll forget this sunburn anytime soon! Michelle: A-ha, one of the no-names. Must be why I couldn’t remember the name: there isn’t one! LOL And UGH! I didn’t get a photo of the fine-looking Merch Mart; I had the perfect shot on the way out west on the river, but was listening to the docent talk about the building that you worked in and didn’t snap any photos of it. On the way back, my view was blocked! I know what you mean about feelng a thrill just seeing the skyline. I felt that way when I lived on the SF peninsula and went into the city. I also felt that way about Portland, Oregon when I lived there. I knew these cities like the back of my hand, knew all the places to eat and have coffee, see a show, where the museums were. Now I’ve lived 45 minutes outside of Boston for 15 year but I’m still not even close to being a local. NO FEAR MELISA, What a great adventure. The pics were beautiful and I too find it interesting to meet out of towners. Nice people do exist everywhere! I find it Gutsy that you ventured out on your own, kudos to you Melisa. Previous post: Blog Nosh Magazine Launches…and I’m On Board!